2013 was a very satisfying year for fulfilling goals – I got to ice climb with some great friends, climb a mountain with my wife (a life long goal), cycle in two centuries and over come my total inability to swim and compete in a triathlon. 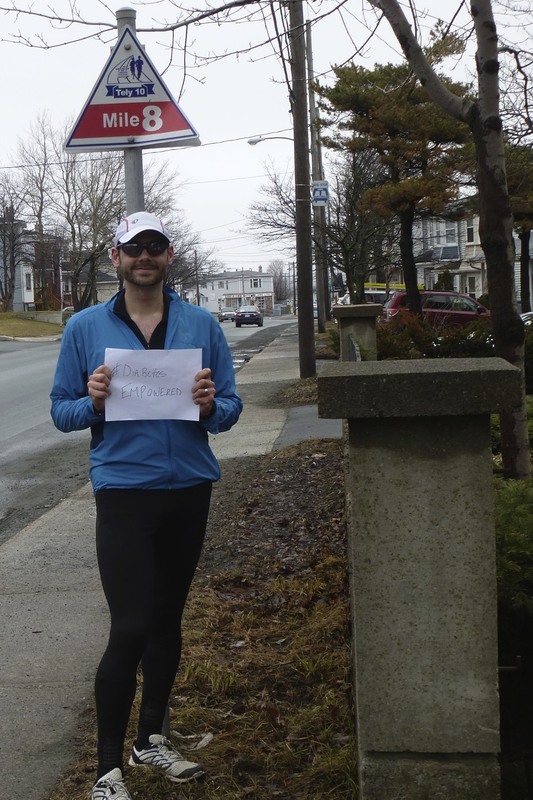 When reflecting on goals for 2014, a couple goals stood out, one of them being to run a marathon. Since it’s really only one goal that I’m setting out, I want it to be ambitious – I’d like my first to be less than 3:30, and I’d love to hit a 3 hour marathon (but let’s not get crazy, I’ll settle for 3:30). This goal is starting to crystallize into something palatable, and I already have the jitters. I don’t know if I’ve ever trained this far out for something. I know I’m capable of a decently paced half marathon in non-race conditions, but I haven’t yet put my body through the glorious agony of a full 42.19 km (or 26.2 as it’s affectionately known). I have a fuelling strategy for a half marathon, and it generally involves one hand held bottle of water (in warmer temps), and a couple of sticky bites (and emergency sugar pills to boot). Eating on the run is challenging, and eating as a diabetic is challenging, so I want whatever I eat to be good! Enter the sticky bites. I’m a huge fan of eating real food. Skratchlabs has turned me on to this, and I truly believe in it. In the Feedzone Portables cookbook there are lots of great recipes for food you can eat while exercising that aren’t gels or sugar pills or gatorade. They taste delicious and they are real food. You’re the envy of a peleton when they are sucking back gels and you are munching on a sweet liege waffle. Or how about blueberry chocolate rice cakes while they choke down a honey stinger. Really, there’s no competition. Plus, for diabetics it’s a win-win because their goal is fast carbohydrates that get in and fuel your muscles (and blood sugar) quickly – so it helps us maintain blood glucose instead of dropping. For running, I choose the sticky bites. 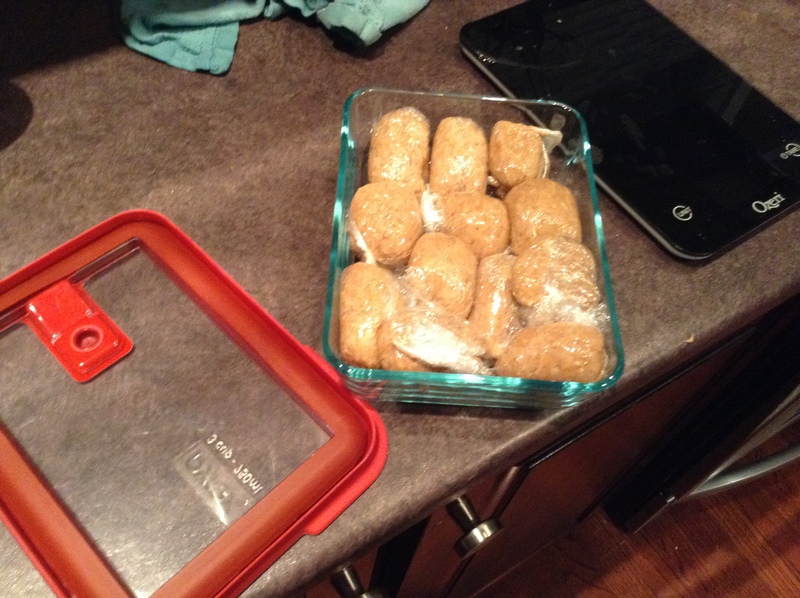 You can easily stuff 4 or 5 of them in a SPIbelt, they weigh next to nothing (38g per for the last batch I made), they are easily digestible (69% water), and they are ~9g of net carbs per bite. 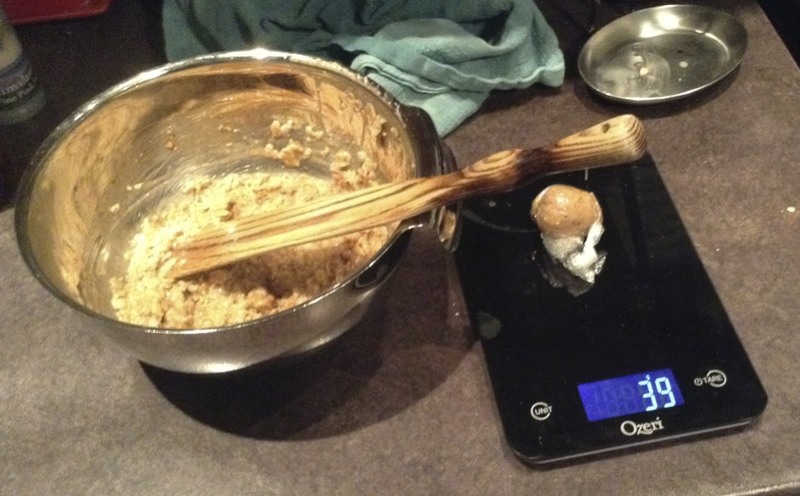 They take maybe 15 minutes to make and…they taste great! And no, that’s not vodka, it’s home made vanilla. 🙂 Apple walnut sticky bites, yum! My plan for my Saturday long run was to take 6 of these in my SPIbelt, a tube of sugar pills in a hip pocket, and CGMS in hand and put on more miles than I have yet. I’d like to hit 30k. For a longer run I try to ensure I have enough fuel on deck to start off right. It’s called “priming the pump”. My food of choice is oatmeal. I setup the rice cooker on Friday night to have a nice, steaming bowl of steel cut oats ready for my wife and I. She had to fuel her brain for yoga teacher training so it was a win win. Anyways, oatmeal with an egg “cooked” into it, chia seeds, nuts, greek yogurt = 47 g net carbs, 42 g protein. I bolused for the 47g carbs (80/20 combo, 2 hr delay), but not the protein (I usually bolus protein if it’s over 20g, at half value, so normally that’d be (42-20)/2 – easy right!). I hit the road with an 8.3 an arrow up because I dosed to ensure I’d have a bit of breathing room. Now, here’s where I debated uploading my HR/CGMS data. My sensor is a bit old (i.e. past the 7 days). It was reading a bit off – when I tested 8.3, it was only reading 5 with an up arrow. So I knew that it was running a bit low. Literally, right after I started running it bottomed out and started alarming. The thing is, I know from lots of runs what I feel like when running low, and I didn’t feel that way, so I made a decision to run with the “low” CGMS. I didn’t trust the number, but I trusted the trend. If I could keep it flat or elevate it some then I’d be happy. Below is a comparison of heart rate data and CGMS. Overall, I’m happy with the results. The HR data got really sporadic as I got more drenched in sweat, but I have a solution for that in the near future. 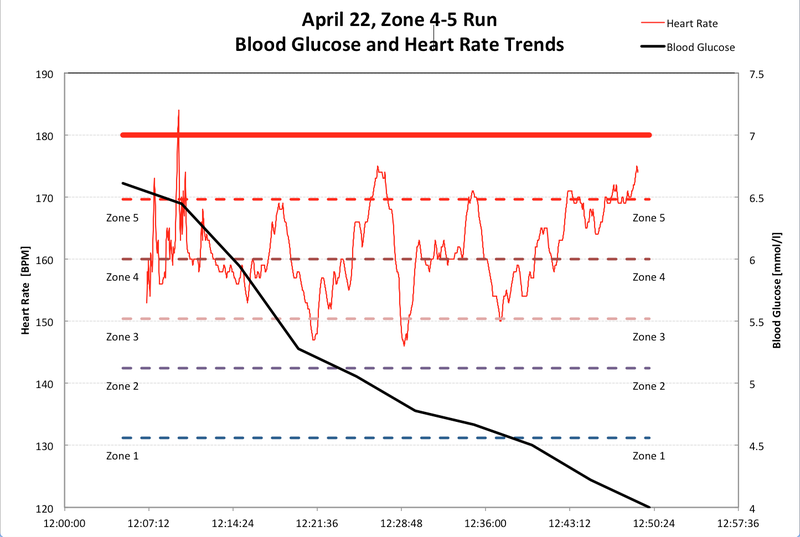 Also, after a couple stops you can see some erroneous heart rate spikes – I was not sprinting, the HR strap just read high when it shouldn’t have. Other than that, you can see that I tried to stay in zone 3 for most of it. The zone 4 at the start was the uphill portion from my house to the start of the Tely 10. HR dropped for the remainder of the run because the Tely 10 (run the proper direction) is a mostly downhill course. 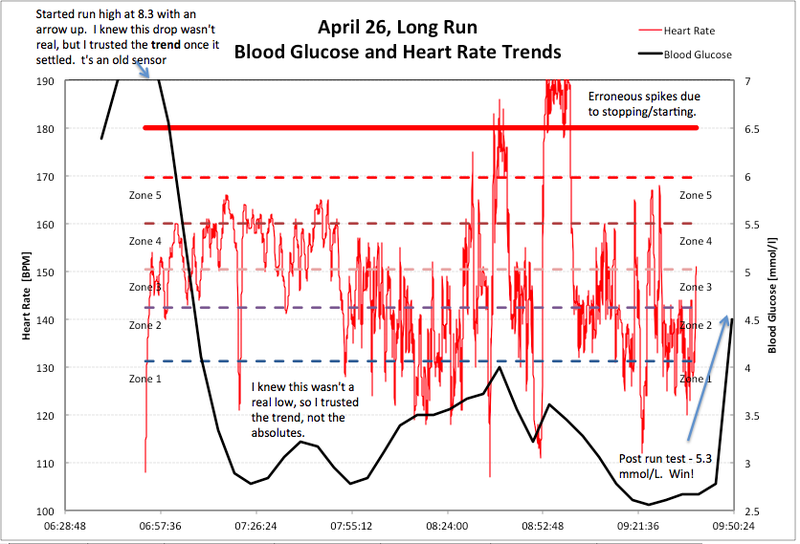 Anyways, enough about HR data – what I want to talk about most is how well the glucose and HR data tie. 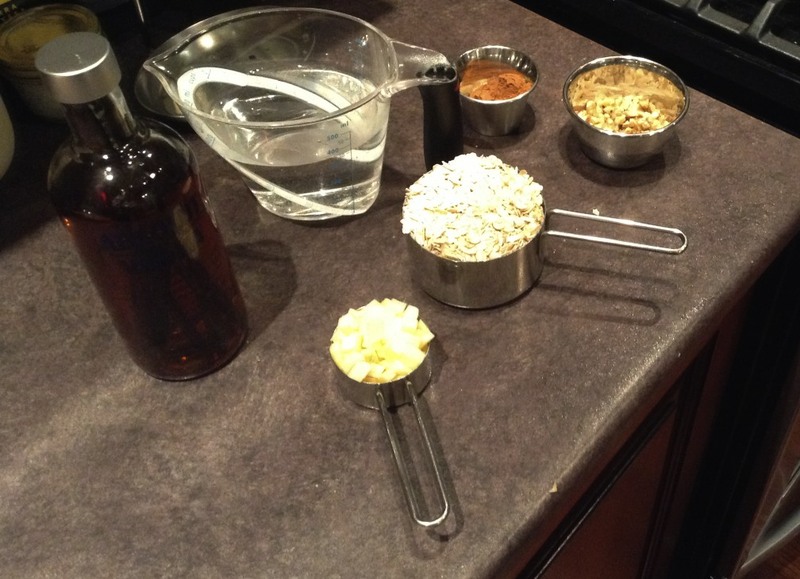 First, a bit about my fueling strategy. During the uphill portion I fueled up more – I ate 2 bites at 28 minutes in (+18g carb), and another at 1 hour (+9 g carb). The first two managed to keep my glucose steady for the whole uphill portion. By eating the third right before the downhill you can see my BG actually rose – this was probably because of the lesser effort required in the downhill (and the corresponding drop in HR). 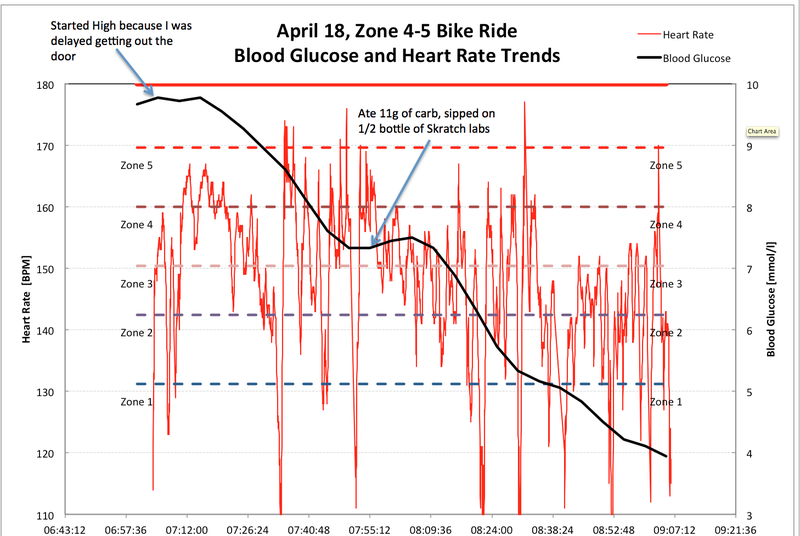 As you go into Zone 2 and 3 your body uses less carbohydrates and this shows it. I did not bolus for any of these bites based on my trends and knowing I had that combo bolus active. With only 1/3 of the run done I consumed 1/2 of my nutrition. This was intentional because I knew I was putting out more effort on the uphill and needed to keep my carbohydrates up because of the higher exertion. On the downhill return I consumed at 1:27 and 1:56 (+9g each), here I was trying to space out my eating to ensure a constant level of carbohydrates. I think the trend shows I was pretty good at this. I probably should’ve eaten two balls at 1:56 because I started to feel pretty run out by the time of my last fueling – at 2:28 with 3 km to go. Still, I made it home, tested and sure enough I was a 5.3, not a 2.7 like my CGMS suggested. I did drink my entire water bottle (10 oz). I did not eat one sugar pill or use my backup gel. I did not bolus for any of the bites on the run, again because I knew I had an active drip from my combo bolus. Still, when I got home I did bolus for that last bite as it was only eaten several minutes before. And 32.5 km later, it’s a success! I’m really excited about running a marathon in August – I know I can do it, and I know I can plan my food accordingly! Overall, I’m really happy with the run. I do wish the CGMS data was more accurate (vs. reliable), or that my HR wasn’t being stupid, but I think you get the picture. I did learn a few things – the SPIbelt felt cumbersome, so I just stuffed my jacket side pocket (that won’t be possible in the summer) – I may try and find higher carb bites to help me get more for less. I also learned that unwrapping these bites mid run is not possible when you have gloves on – that won’t be an issue in August. Still, it made me a bit mad because I normally don’t stop when running, so that added around 5+ minutes to my time. Finally, I learned (or relearned) about the importance of body glide – no I wasn’t bleeding, just tender. 🙂 It made me laugh. My feet and knees felt great, but my legs were starting to get quite tired. Given this was my longest run to data, I did 32.5 km in 2:39 – a 3:30 marathon should be no issue, yay! My next long run shouldn’t have half the issues I had on this one. I hope sharing this experience helps other diabetics understand that it is possible to plan and execute these, and eat good food while doing it. We already have to choke down sugar pills, don’t suffer through gels!